Sleek new ergonomically designed pop-up boxes provide real ease of use and rapid connection solutions for mobile applications such as PCs, mobile phones, audio and video systems. Available in 4 elegant finishes of Aluminium, Bronze, Stainless Steel, black or white. 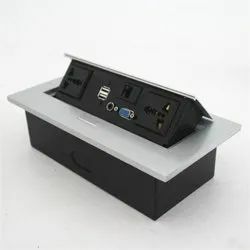 Pop Up Box is used in new age furniture to interface the electrical and connective cables like VGA, HDMI and power into one console keeping the wires concealed. Avail from us best quality of Hydraulic Cable Cubby, made utilizing latest technologies. RAYMAX CONFERENCE ROOM cable cubby/popup box is an ideal solution for conference room to manage their av connectivity. Specification: - 100% brand new. - Type: multiple socket - Hole median: 5 hole - Color:Gold - Rated voltage:250V - Current Rating:16A - Working Temperature : -30 °C -60 °C - Certificate: ETL, CETL, FCC. - Item size: 12cm x 12cm Application: The station, airport, hotel, clubs, Coffee hall, home decoration, etc. Creavita. Modular Systems Pvt. Ltd. The Pop Up Box provided by us is known for being sturdy and durable. It does not get damaged in case of accidental slips and falls.